What was it like to be Charles Dickens? His letters are the nearest we can get to a Dickens autobiography: vivid close-up snapshots of a life lived at maximum intensity. This is the first selection to be made from the magisterial twelve-volume British Academy Pilgrim Edition of his letters. From over fourteen thousand, four hundred and fifty have been cherry-picked to give readers the best essence of 'the Sparkler of Albion'. 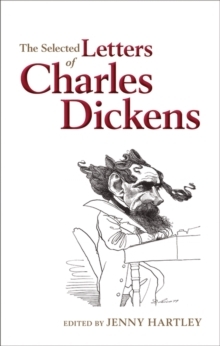 Dickens was a man with ten times the energy of ordinary mortals. There seem to have been twice the number of hours in his day, and he threw himself into letter-writing as he did into everything else. This eagerly awaited selection takes us straight to the heart of his life, to show us Dickens at first hand. Here he is writing out of the heat of the moment: as a novelist, journalist, and magazine editor; as a social campaigner and traveller in Europe and America, and as friend, lover, husband,and father. Reading and writing letters punctuated the rhythms of Dickens's day. 'I walk about brimful of letters', he told a friend. He claimed to write 'at the least, a dozen a day'. Sometimes it was a chore but more often a pleasure: an outlet for high spirits, sparkling wit, and caustic commentary - always as seen through his highly individual and acutely observing eye. Whether you dip in or read straight through, this selection of his letters creates afresh the brilliance of being Dickens, and the sheer pleasure of being in his company.